Sweet and Spicy Peppadew Jam adds a nice kick to these lean bison burgers. Top them with a sunny-side-up egg and you have one of the best burgers in town. Your taste buds will thank you! Hamburgers, in general, are an American icon in the food realm. And hands down, this Bison Burger with Peppadew Jam is one of my all time favorites. I have to warn you though, it’s messy. Like all “over your face” kinda messy. But of course, I wouldn’t have it any other way. The ground bison is healthier than regular ground beef. I choose bison because it is leaner than regular beef and therefore has fewer calories and fat. Bison is more flavorful, has a sweeter taste and is not gamey. Because of federal and industry regulations, most bison are raised in the US without antibiotics or hormones, which in my book is always the way to go. A sunny-side-up egg on top the patty adds both texture and taste to the entire burger. There’s something about a runny yolk dripping down the side of a juicy burger that makes it irresistible. Peppadew jam is the crowning jewel of this burger and brings a depth of sweet and spicy. This alone, in my opinion, is what truly makes this burger stand out beyond the rest. Bison in times past was considered exotic meat that you could only find in exquisite restaurants. But now you can pretty much find it in any natural grocery store. I picked up this ground bison at Sprouts but I’m sure you could grab it at Whole Foods, Trader Joes or Nature’s Own Health Food Store. Because this burger has so many components with the fried egg and peppadew jam, I wanted to season the ground meat very simply with only kosher salt and freshly ground pepper. I used 1 teaspoon of salt and 1/2 teaspoon of pepper for each pound of meat. Bison, in particular, is very lean meat and has little moisture, therefore fry or grill it on a lower heat setting. I used a cast iron griddle and started the temperature out at medium-high heat in order to get the bottom of my skillet nice and hot. I then turned it down to medium before I put the burgers in. This way, I was able to get a good sear to begin with. Don’t overcook the burgers. Medium is the best internal temperature for these burgers (145°F). If you cook them any longer they become dry and tough. I pan “grilled” these 1/2 pound patties for 4 minutes on one side, flipped them over and cook for 4-5 minutes on the other side. These are wonderful to throw on the grill also especially during the summer months when you don’t want to heat up your kitchen. Preheat the grill on the medium-high heat setting and follow the directions just like if you were to cook them in the skillet (above). Start with a large non-stick skillet that gives plenty of room for the eggs to not run into each other. A well-seasoned cast iron skillet works great. Also, these egg rings (pictured above) are perfect for cooking individual eggs. One of my least-expensive, most favored kitchen gadgets. Heat the skillet over medium until hot. Add 2 tablespoons of butter to the skillet, crack each egg separately into the egg rings, turn down the heat to medium-low. As the eggs are cooking, spoon some of the hot butter over the egg whites, avoiding the yolks though. Continue until the whites are cooked through and no longer opaque. Peppadew jam is one of the easiest condiments to prepare and it’s what makes this burger THE BEST. It’s simply a jar of sweet chili Sauce combined with 1 1/2 cups chopped peppadew peppers and simmered for about 20 minutes. I purchased Frank’s Red Hot Sweet Chili Sauce at the grocery store for just a little over $3. You can find peppadew peppers in the olive bin of most grocery stores. They are little round red peppers about the size of a large cherry tomato. 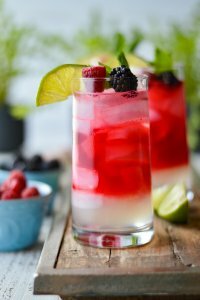 They add a sweet, spicy and tangy essence to the jam. A toasted bun with grill marks. I brushed each cut side of the bun with olive oil and placed them on a hot (medium heat) cast iron griddle and cooked until the bun became a beautiful golden brown. Next, I added a couple of leaves of butter lettuce to the bottom bun. Butter lettuce is tender but durable for this hearty burger. But you can use anything you like, spinach, romaine, etc. The star of the show, 1/2 pound bison patty, is perfectly placed on top of the lettuce. A slice of pepper jack cheese. Pepper Jack is flavored with Jalapeño and Habaño peppers and is the best choice for this burger. The added heat compliments the sweet and spicy jam. Pepper jack is semi-soft and creamy so it melts perfectly over the patty. Sunny-side-up egg tops the patty. And then, of course, the sweet and spicy peppadew jam for indulging. Lots of jam. You want it all over your face when you’re done. The Top bun completes this masterpiece. And there you have it – the BEST BURGER IN TOWN!! Guaranteed. At least I think so. 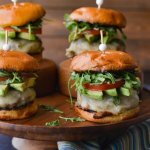 Since Game Day and/or Tailgating season is upon us, you could make these into mini bison burgers for the perfect sliders. Serve them on a platter, watch the game with your friends and wait for all the cheers that are about to come your way. Please check out some other great game-day ideas. 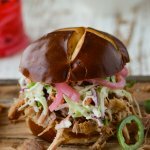 Mini Taco Wonton Cups, Slow Cooker Pulled Pork Sandwiches (make these as sliders), Loaded Potato Skins, Parmesan Chicken Bites. 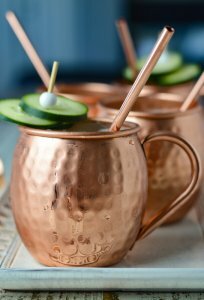 Click on each of these for some fabulous recipes. 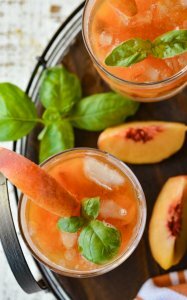 If you want a really good cocktail to go with all the cheers, check out my Peach Bourbon Cocktail. It’s fantastic. 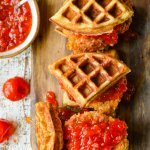 Another idea for sweet and spicy peppadew jam is Chicken and Waffles. 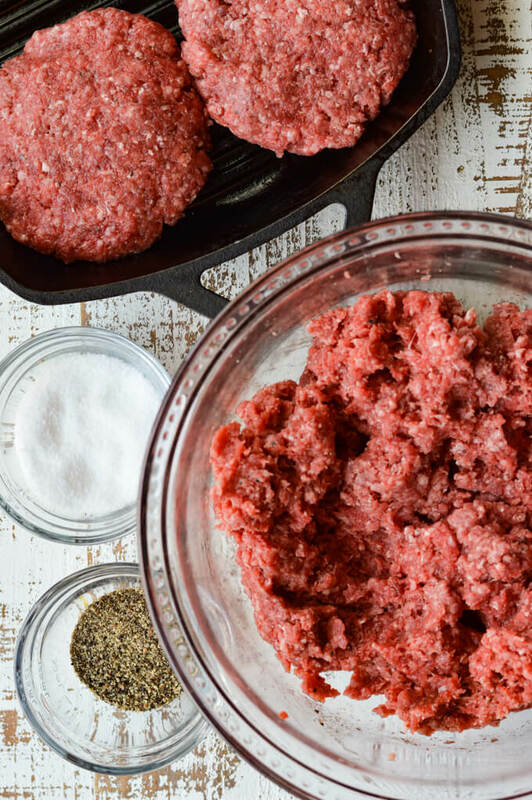 Combine ground bison, salt, and pepper and make into 1/2 pound patties. Heat a cast iron griddle over medium-high heat until very hot. Add the patties and turn the heat down to medium. Cook on one side for 4 minutes to get a good sear. Turn the patties over and cook for an additional 4-5 minutes until the internal temperature reaches 145°F. Remove the patties onto a plate and cover with foil to keep warm. Brush the cut side of each hamburger bun with olive oil. Place cut side down in the cast iron griddle. Toast until golden brown. Layer the bottom bun, 2 lettuce leaves, bison patty, pepper jack cheese, sunny-side-up egg and 2 heaping tablespoons of peppadew jam. 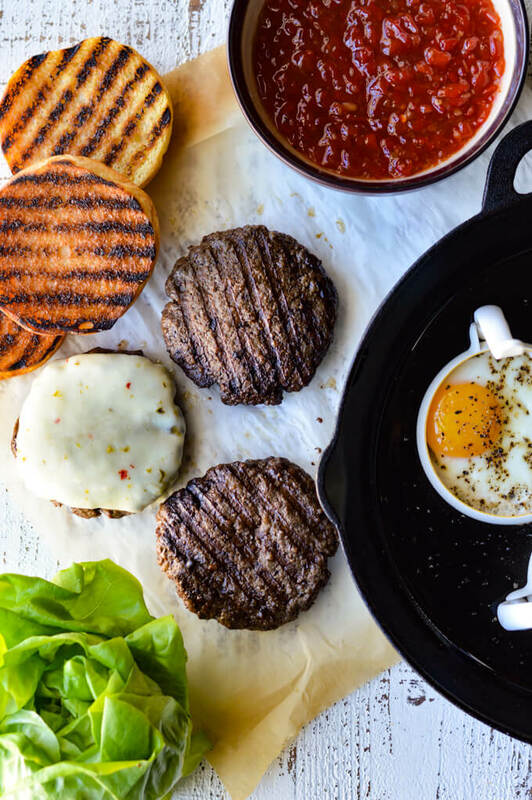 Because this burger has so many components with the fried egg and peppadew jam, Season the ground meat very simply with only kosher salt (1 tsp per pound) and freshly ground pepper (1/2 tsp per pound). Bison, in particular, is a very lean meat and has little moisture, therefore fry or grill it on a lower heat setting. Get the griddle very hot over medium-high heat first. After you place the bison patties in, turn it down to medium. This will give an initial good sear but will continue at a moderate temperature. Don’t overcook the burgers. Medium is the best internal temperature for these burgers (145°F). If you cook them any longer they become dry and tough. Because these are thick burgers, I cooked for 4 minutes on one side, and 4-5 minutes on the other. If you use 4 or 6 ounces patties, you will cook them less. 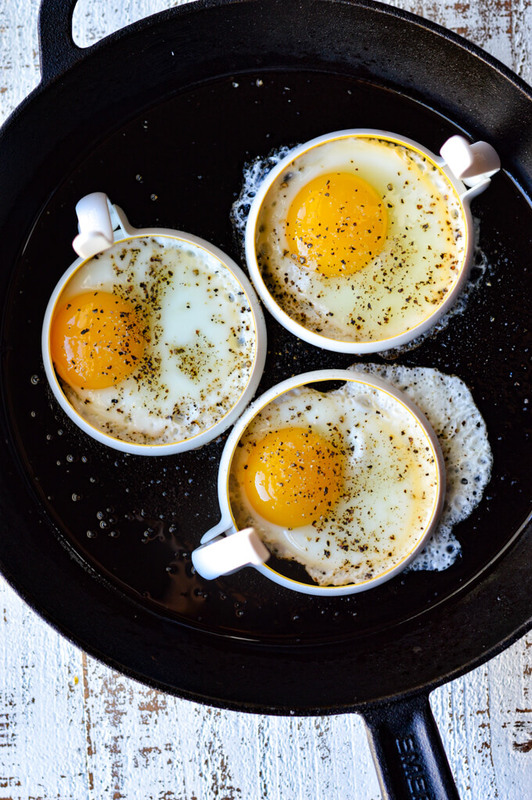 The Perfect Sunny-Side-Up Egg. Use a non-stick pan or a well-seasoned cast iron skillet. Heat the skillet over medium until hot, add 2 tablespoons butter, crack each egg into the skillet and turn down the heat to medium-low. Spoon the butter over the egg whites while avoiding the yolk. Continue until the whites are cooked through and no longer opaque. Peppadew Jam. 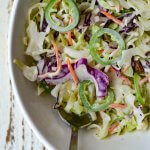 In a small pan, combine the 1/2 cup chopped peppadews, 1 12 ounce jar ofSweet Chili Sauce. Bring to a soft boil over medium-high heat. Turn the heat down and simmer for 20 minutes until peppers become soft and the sauce becomes thick. Set aside to cool. I’m not a huge burger fan, but I’d certainly eat this one! I love all of the components of it. And I know where to order bison! Thanks so much Mimi. The peppadew jam is what really makes the burger. Wow! Talk about flavor on top of flavor on top of flavor! This sounds A-mazing 🙂 I have to make this peppadew jam! Thanks Carrie! The peppadew jam is ridiculously good and quite addictive! Hope you enjoy!